I am a practising artist and florist with over a decade’s experience and in 2016 I set up my own floristry business as a floral artist. This was born on the back of what seemed to be an abundance of flowers in contemporary art, of plants in art installations and significantly the first year Frieze Art Fair was sponsored by a florist, That Flower Shop. At the same time in the floristry world there developed a surge of florists without formal training (given instagram and social media according to Alice Vincent: Floral Revolution) which saw a rise in floral installation and innovative (non-traditional) artful arranging. I aim to work at the borders of flowers and art by both creating conceptual flowers (which my friends warned me against – as they sound like something which might not be made of flowers) and working for contemporary artists using flowers, alongside the bread and butter work of making bouquets and doing event floristry. I’ve now re-titled conceptual bouquets as “topical” and recent pictured examples range from the Interrobang bouquet commenting on a new form of punctuation, to a hanging arrangement dedicated to Trump’s proposed closing of the Mexican border. Double hanging arrangement February 2017, “Closing the borders opened the gates of hell.” Photographed by Sebastian Boettcher. punctuation being taught to under 5’s used to denote an excitable or rhetorical question. It is the combination of manual labour and colour planning, alongside the unexpected nature of working with flowers that got me hooked to floristry. The more I work with flowers, the more surprised I am by their resilience not only in terms of lifespan within an arrangement but in how they organise themselves too within a display: it can be almost autonomous! For larger events I find myself using my practical artistic skills alongside skills gleaned from my MA in Arts Education and Curation, drawing designs and building prototypes to consider the flow of the space and how the experience of the flowers will impact at various stages of the event. I have a weakness for combining materials and more often than I ought to probably, I consider using concrete. Like any other artist’s material flowers are loaded with historical connotations and issues of sustainability include at a glance: their readily acquirable worldwide availability as compared to their original export and introduction to Britain, their evolving meanings during different epochs and changes in significances across the world and lastly their developing narratives of display and positioning alongside art. An example of this interplay is the Metropolitan Museums fabulous commissioned vases refreshed every week and subsequent exhibition of ten years of flower drawings by Abbie Zabar which makes it hard to fathom who the artist in all of this: the museum for providing niches for the works which should hold sculptures hence changing their context, the benefactor for funding the creations within this institution, the florist for designing and making them or the painter for capturing and displaying them as art. Flowers have long been a popular subject for artists given their beauty and transience: drawing attention to the passing of time and fleeting moments of everyday beauty. In contemporary art there now seems to be an opening up of a political and conceptual dimension extending from these inherent qualities. 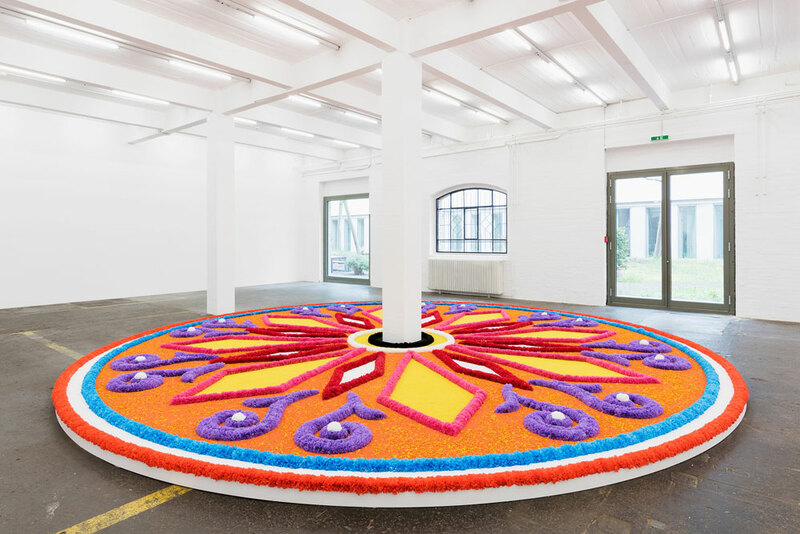 Kapwani Kiwanga “Flowers for Africa” and Taryn Simons “Paperwork and the Will of Capitol” both look to the silent witnesses in the room of treaties, coups and agreements, re-staging and documenting the flowers in the room to re-assess history. Whilst Simons’ floral works are displayed as photographs, Kiwanga’s are recreated and allowed to rot over the duration of each exhibition, sharpening focus on both the precise moments where the world changes and the repercussions of such negotiations. Ai Wei Wei’s “With Flowers” shows a series of images of flowers in a bicycle basket. This bicycle was outside his confine in Beijing where the flowers were replaced and photographed daily, documenting the length of time he spent awaiting his passport: this kaleidoscope of flowers belying the inflexibility of the Chinese regime. Jill Magid, The Offering (Tapete de Flores), 2016, Kunst Halle Sankt Gallen.